The Guttmacher Institute was founded in 1968 as the Center for Family Planning Program Development. The Center was originally housed within the corporate structure of Planned Parenthood Federation of America (PPFA). Its early development was nurtured by Alan F. Guttmacher, who was PPFA’s president for more than a decade until his death in 1974. The Center was renamed in Dr. Guttmacher’s memory, and the Guttmacher Institute incorporated as an entirely independent nonprofit policy research institute with its own Board in 1977. At a press conference PP-WP said the centers would be financed by federal funds obtained by the Children’s Bureau and the Office of Economic Opportunity (OEO) ad supported by private grants from the Kellogg, Ford, Rockfeller, and Code Foundation. 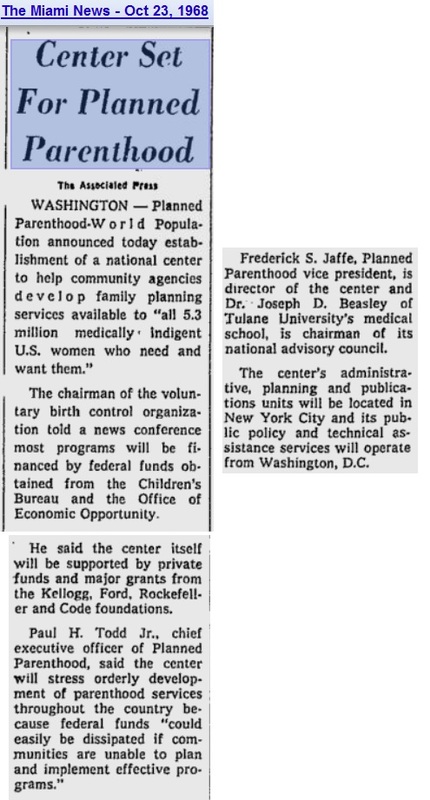 Frederick S. Jaffe was the Planned Parenthood VP at the time and Dr. Joseph Beasley was chairman of Planned Parenthood’s advisory council. Administration for the center was then located in New York. Today the Guttmacher Institute is known as the research arm of Planned Parenthood. The media prints their abortion and family planning claims as if they are from the mouth of God and have no bias….well…they do ! The article below details the way that Planned Parenthood’s Alan Guttmacher, Frederick Jaffe, and Dr. Joseph Beasley worked together. All three have ties to eugenics. 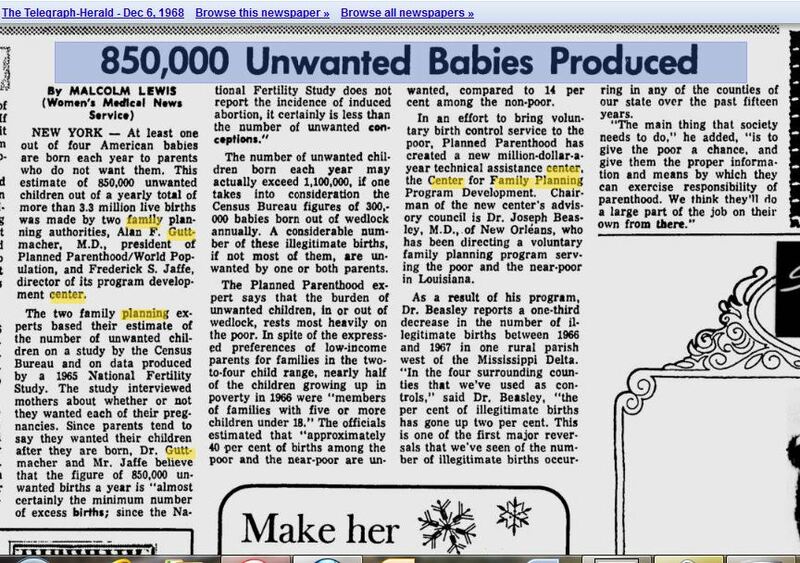 In the 1960s, Dr. Joseph Beasley, a member of Nixon‘s Commission on Population Growth, oversaw an aggressive eugenics program that concentrated on black neighborhoods in New Orleans. This project would eventually be described by Planned Parenthood President, Alan Guttmacher, as the number one success story in the history of the American birth control movement. It also led to Beasly being elected Chairman of the Board of Planned Parenthood in 1970. Then in 1975, Beasly was sent to federal prison for conspiring to defraud the United States government of $778,000 that had been allocated for the project. In court, a local black civil-rights activist named Sherman Copelin testified that he took pay-offs from Beasley for helping to convince residents of the targeted neighborhoods that birth control was not black genocide. In March of 1972, the Commission on Population Growth and the American Future which Nixon had created three years earlier began calling for the nationwide legalization of abortion. This Commission and move was applauded by former Planned Parenthood vice president Fredrick Jaffe. Guttmacher Institute is the Research Arm for the largest provider of abortions nationally and internationally – Planned Parenthood and was named after one of Planned Parenthood’s President – Alan Guttmacher. The Guttmacher Institute envisions a world in which all women and men have the ability to exercise their rights and responsibilities regarding sexual behavior, reproduction and family formation freely and with dignity. In this world, women and men in every country are able to avoid unwanted pregnancies, prevent and procure treatment for sexually transmitted infections, obtain safe abortions, achieve healthy pregnancies and births, and have satisfying sexual relationships. From it’s beginning, Guttmacher and Planned Parenthood has been muddied up in eugenics and now abortion has been the tool used to drastically limit the Black and Latino populations. So be aware when you’ve been Guttmacher’d. It blindsides you with alarming yet unqualified statistics (full of self-citations) and convincing buzzwords like “scientific” and “comprehensive”. When Guttmacher’s CEO cannot grasp simple math, like the difference between zero and $2.4 million, everything else should become suspect. It’s ironic, though understandable, that the Guttmacher Institute’s umbilical cord hasn’t been cut. Planned Parenthood apparently still values the child it’s given birth to and wouldn’t dare end its life regardless of viability. 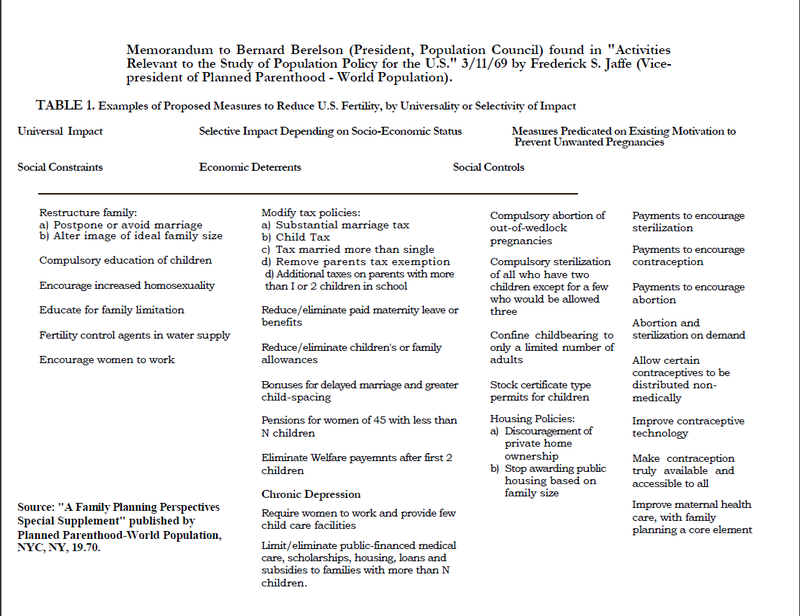 This entry was posted on January 9, 2013 at 5:06 am and is filed under Eugenics, Ford, Guttmacher, Jaffe Memo, Kellogg, Planned Parenthood and Eugenics, Rockefeller with tags Alan Guttmacher, Bernard Berleson, birth control water, Center for Family Planning Program Development., Children's Bureau, Commission on Population Growth and the American Future, Dr. Joseph Beasley, Eugenics, Frederick Jaffe, Kellogg, Office of Economic Opportunity, Planned Parenthood, Planned Parenthood World Population, Population Control, PPFA. You can follow any responses to this entry through the RSS 2.0 feed. You can leave a response, or trackback from your own site.